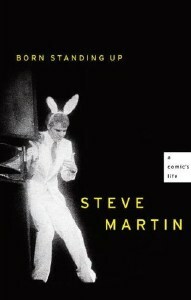 Before Steve Martin was a movie star, playwright and art collector, he was one of the biggest standup comedians in the world, and this modest, straightforward, winning book explains how that happened. Martin started as a teenage magician and all-around performer in southern California, and he furnishes a clear-eyed account of his early career, including a moving account of how he almost quit the business but was saved by a good review in Miami. When the rewards (both critical and commercial) weren’t forthcoming, he propped himself up with grand thoughts about how his madcap abstract comedy might one day change everything. “No harm in charging oneself up with delusions between moments of valid inspiration,” he writes. Martin’s offstage life—or at least his recollection of it—is as ordinary as his comedy is defiantly unordinary. He struggles with his family, especially a distant father who harbored theatrical dreams of his own. He works hard to overcome what he perceives as a lack of talent. He gets girls, sometimes. He stays decent. As his early career skips along like a Wright Brothers experiment—haltingly, and with only the faintest hope of taking off—he crosses paths with performers who would be forgotten were Martin’s memories not so fond and vivid. Magicians, monologists, high-kicking actors in regional musicals, backup dancers from TV variety shows, folk-music diehards: they, as much as the author, humanize the idea of the working entertainer and form the book’s sweet core.